CARLSBAD — Carlsbad has devised a new strategy for enhancing access and recreation along the city’s coastline. With this effort, the city aspires to advance more livable streets projects and pave the way for enhancing beach services and recreation with a new partnership with the California State Parks Department. During the Oct. 15 City Council meeting, both city staff and council members concurred that enhancing the city’s coastline for residents and visitors should be a priority for Carlsbad. “This is a real opportunity for everyone to meet a dream that most stakeholders have,” said Mayor Matt Hall. Assistant City Manager Gary Barberio explained that city surveys, particularly those conducted for Envision Carlsbad, revealed that residents wanted more services and gathering spaces along the beaches. “A lot of the reason people chose to live in Carlsbad is because of the coastline resources,” he said. Barberio said that many residents suggested more benches and restrooms, bike trails along the beach, beach equipment rental shops, concession stands and oceanfront dining venues. But with most of Carlsbad’s beaches owned and managed by the California State Parks Department, enhancements on the beach itself lie mostly out of the city’s hands and would take years of collaboration with the state. So the city has developed a new strategy focused on making headway on projects along the coastal corridor, which is under the city’s control and would not require approval from the state. In doing so, the city would realize the benefits of these projects, such as enhanced user experience, increased safety and potential private investment, sooner. Under this direction, the city would specifically look to develop new “livable streets” projects along the entire stretch of Carlsbad Boulevard. These projects could include replacing stoplights with roundabouts, adding pedestrian crossways, expanding bike lanes, and improving coast walkways with benches and public art. 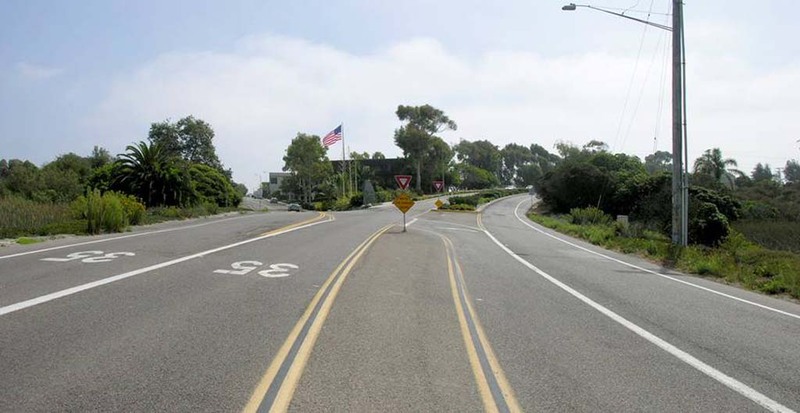 Previously, the city had been working on a possible land exchange with the state in order to realign Carlsbad Boulevard, which would push the road’s southbound lanes to the east and make room for beach amenities, added parking and more. The project was limited from only Cannon Road to the southern city limit. “We felt like the discussions with the state were too narrow,” said Peder Norby. Norby previously played a large role bolstering downtown Encinitas, but was hired this summer to work as a consultant on Carlsbad’s city enhancement projects. Under the latest strategy, the city would also work to develop a broader partnership with the State Parks Department to cultivate new beach projects in addition to the potential land exchange. City staff pointed out that Carlsbad’s beaches have become lackluster when compared to nearby cities that have enhanced their coastline. Encinitas completed an upgrade of Moonlight Beach this summer that included a new concession stand, beach rental shop, restrooms, and lifeguard station. In 2011, Solana Beach renovated its Fletcher Cove Community Center, which overlooks the ocean. City Council unanimously approved the new coastline improvement strategy. City staff will come before council at a future date with proposed coastal corridor projects with a timeline and budget.